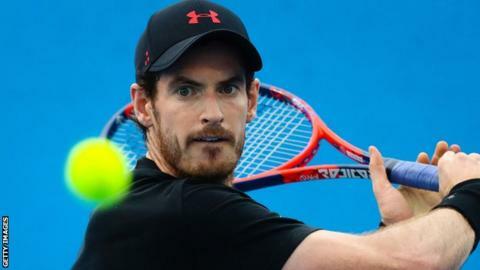 Former world number one Andy Murray says he doesn't mind if he is playing at "30 in the world level" as he prepares to return from six months out. The 30-year-old Briton's ranking has dropped to 16th in the world having been out since July with a hip injury. Murray is set to make his return at the Brisbane International as he prepares for the Australian Open in January. "Right now the hip is the only thing that is any concern. The rest of my body feels really good," he said. "I just want to enjoy playing again. I've really missed it the last six months or so." Murray lost a one-set exhibition match against Spain's Roberto Bautista Agut in Abu Dhabi on Friday prior to heading to Australia. He has a first-round bye at the Brisbane International and has been drawn to play Ryan Harrison or Leonardo Mayer in the second round at a tournament intended to act as part of his warm-up for the Australian Open, which begins on 15 January. Many of the leading men's players have been affected by injuries recently, with Rafael Nadal, 31, missing the Brisbane tournament with a knee issue while Novak Djokovic, 30, withdrew from the Qatar Open because of the elbow problem that has kept him out since Wimbledon. Murray says he intends to take more breaks from the ATP Tour as he gets older in a bid to avoid further injury. "Certainly, when you miss a period, you realise how lucky you are to be doing this as a job," he added. "Giving yourself breaks, especially as you start to get older, I think, is very important and something that I'll certainly be looking to do for however long I keep playing. "For tennis as a sport, it's not good when so many of the top players are injured and for extended periods. "I certainly think it's something that should be looked at and to understand why, what the reason for that is." "With Djokovic pulling out of a tournament in Abu Dhabi, and Nadal's pulled out of Brisbane, Wawrinka's postponed his recovery, you know it's really worrying times and they keep adding on more tournaments. "These players are playing at such a level now, physically, that I just don't think it's humanly possible for them to do the calendars that they're doing. "All of them are now talking about managing their career and that's not good for the game, I think the game's got to have a serious look at itself."